If you’re looking for the BEST BANANA CAKE EVER, this is your cake. 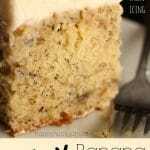 Slathered with a thick layer of cream cheese icing, this banana cake is moist and delicious every time. It’s a great way to use up frozen or over-ripe bananas and quite simply, it’s the only banana cake recipe you’ll ever need. I know what you’re thinking. How crazy can a banana cake with cream cheese icing be? Well, first of all, this cake is crazy-good, but that’s not the reason for the name of the recipe. The reason I call this the crazy banana cake is because of the unusual baking and cooling methods that the recipe calls for. Don’t worry. They’re not difficult. They’re just… well… kind of crazy! What makes this banana cake crazy? I honestly forget where I got this recipe. I’ve been making it for years. It’s a crazy little recipe, so I’ll clarify a couple of things right off the top. First of all, this cake is baked at an unusually low temperature: 275ºF. This banana cake goes straight from the oven into the freezer. This is the secret to the cake’s moistness. For this reason, you’re going to want to bake this cake in a pan that can withstand the quick change in temperature. I use my 9 x 13 Pyrex baking dish. I don’t cover the cake when I put it in the freezer. I just place it in the freezer with a towel folded underneath it to prevent the heat from transferring into other items in my freezer. You will also love my crazy-good carrot cake with cream cheese frosting. Want to make it more nutritious? You can swap out half of the all-purpose flour with whole wheat flour. For something a little less decadent, try my bread machine banana chocolate chip loaf. 1. Pre-heat oven to 275º F, and grease and flour (or spray) a 9×13 cake pan. 2. Mash your bananas, and mix with lemon juice. Set aside. 3. In a med bowl, mix flour, baking soda and salt. Set aside. 4. For homemade buttermilk, combine milk and vinegar/lemon juice in a small bowl. Set aside. 5. In a large bowl, cream butter and sugar with electric beaters. 8. Beat in flour mixture alternately with buttermilk. 10. Pour batter into your cake pan. Bake at 275º F for 1 hour and 10 mins (or until knife comes out clean). Note: Ovens may vary. If your cake does not pass the toothpick test at the 70 minute mark, bake it longer, checking every 10 minutes until it’s done. Take the cake out of the oven and place it in the freezer for 45 minutes. You don’t need to cover the cake, but you’ll want to place it on a thick, folded towel to protect items underneath. Remove after 45 minutes let it sit on the counter until it’s cool enough to frost. Cream the butter and cream cheese. Beat in vanilla and icing sugar on low speed until combined, then high until smooth. This recipe makes a lot of cream cheese icing. You can halve the recipe if you’d like. I personally love cream cheese more than life itself, so the thick layer of frosting makes me a very happy hooligan indeed. 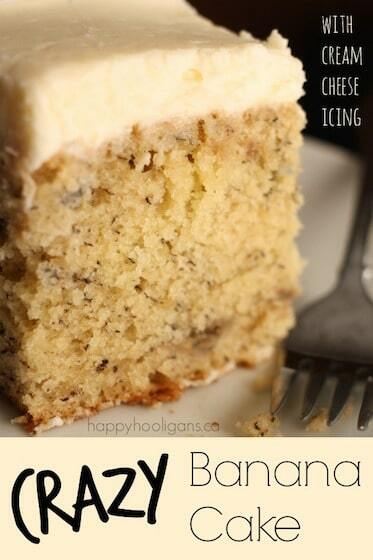 Slather that icing all over your crazy banana cake, and enjoy! Pour yourself an ice cold glass of milk, and enjoy! One bite of this super- moist crazy banana cake with cream cheese icing will have them begging for more. The way you bake and cool it is kind of crazy, but that’s the secret to this cake’s success. Pre-heat oven to 275 F, and grease and flour (or spray), a 9x13 cake pan. If you're making your own buttermilk, combine milk and vinegar (or lemon juice) in a small bowl, and set aside. Pour into cake pan and bake 1 hour and 10 mins (or until knife comes out clean). *if need be, cook longer, checking every 10 minutes until cake is fully cooked. Immediately place in freezer for 45 minutes. (if not completely cool upon removal from freezer, let cool further before icing). Beat in vanilla and icing sugar on low until combined, then high until smooth. If that wasn’t enough “crazy” for you, check out crazy cakes over at Sweet Little Bluebird. If you would normally bake a cake at 350, just take it down a bit to 275, Kristina. please, has anyone tried making this without putting it into the freezer? I made cake today, it is fantastic,big hit. You must’ve just missed it, Diane. It’s on the same line as the flour – you add flour and buttermilk alternately. Forgot to ask the other question? Can it be made in a bunt or tube pan? I usually thin the icing to a glaze or ice while little warm? What do you experts think? I have this cake in the oven right now, and it is overflowing the pan and sitting on the bottom of my gas oven! I guess I’ll use a bigger pan next time, although I did use a 9 x 13″. Also, at 1 hr 10 min it is definitely not cooked, so I’ve got it in for another 10 minutes. We’ll see how that turns out. I made these with gluten-free flower (Namaste blend) and it turned out perfectly! Delicious!!! Thanks I was just going to ask this! Did you sub equal amounts? I have the brand from Costco that is meant to just sub equally but a lot of my baking doesn’t turn out when I try that. I’m not sure this will work for you, Vicki. I don’t know much about gluten-free eating, but I understand it means you can’t have anything with flour in it. I just made this with Pamela’s gluten free artisan flour and it came out great! I’ve got one in the oven now…25 minutes left, it’s high but I don’t think it will run over. This recipe reminds me of one my grandmother had, I thought the low baking temperature was a mistake so I never made it. Making this one for the family, I have to stay gluten free so I probably won’t eat it; glad to see that someone commented about gluten free flour, next time!!! Yay. Sounds great! Is confectioner’s sugar “icing sugar”? What happens if I don’t freeze the cake? Yes, that’s the right sugar. I think the cake would be fine if you didn’t freeze it. Freezing it just makes it super-moist. I was wondering if there is a way I can turn this into a diabetic recipe. And if so how can I go about doing it? BEST EVER FOR SURE. Followed recipe exactly and it turned out exactly perfect. Crazy perfect. One question, yes since it has cream cheese frosting, are we to store it in the fridge covered? Thank You so much. I suppose some would probably say yes, but ours doesn’t last for more than a couple of days, so I store it covered, on the kitchen counter. Can you maybe use lime juice in place of the lemon juice ? And apple sauce in place of the butter for the icing ? You can try altering the recipe, but I can’t make any guarantees. Baking is science really, so if you want the same results as the recipe promises, I’d stick to the ingredients that are in the recipe. I’ve never heard of using applesauce in icing. I’m not sure a cream cheese icing made with applesauce would turn out very well. I made this, and it is excellent. It wasn’t hardly cooked at all at the end of 1 hour and 10 minutes, so next time I think I may cook it at 300 degrees. Should it be served immediately or can you make it the day before and if so how do you store it until time to eat? I keep it covered on the counter, it never lasts more than a couple of days. It’s as good the 2nd day as the first, so no, you don’t have to serve it immediately. We made this tonight and followed the directions exactly, we used 2% milk and added lemon juice to sour it. During baking the batter liquified and started boiling over, got all over the oven. What did we do wrong? It’s still baking but I think it won’t set up. Maybe the lemon juice caused the problem? Thanks do much! Hmm. I’m not sure. I’ve never had that problem, and if you read through the comments here and on my fb page, there are a lot of people who make it often, or who have just tried it,and loved it, so I’m thinking maybe there was either a mis-measurement when you were making it, or maybe your pan wasn’t big enough? Did you use a large rectangular 9 inch by 13 inch pan? The lemon juice shouldn’t cause a problem. The lemon juice is an essential part of the recipe. Yes I used a 9 x 13 pan. We dumped off some of the batter and baked it an extra 20 min and it actually came out great. I just can’t figure out what we did wrong! Glad it worked in the end! So strange. I’m glad it worked out for you though, Shawn! Fan forced ovens require longer or a higher temperature but I would guess that the low temperature would be to reduce the caramelisation of the sucrose in the banana (that raisin flavour in the crust). Gonna try this tonight. Cheers! Would using 2% milk instead of Homogenized milk caused this? I made this cake and misread 3/4 cups butter as 3 sticks butter. I panicked but it turned out great. It was for work and I get requested to make it often. A coworker paid me to make one for her child’s birthday and said don’t change a thing so I used 3 sticks of butter again. You would have to lower it to 135c . You are dead right I would never have chosen 135 degrees for baking a cake (180 more usually)…How does this affect the freezer thought thought you were supposed to cool stuff first. Looks yummy =- totally agree with the thick icing. I’m afraid it might. I’ve never done that before, but I know baking powder is a leavening agent, which makes a cake rise. Baking soda doesn’t have the same properties, so I’m thinking it might be a problem. 🙁 Let me know how it turned out. I want to make this for my younger son’s first birthday but prefer less sweet foods. Will it mess it up to use less sugar? Is there a less sweet alternative to icing? All natural though, not a fan of sugar subs. Thanks! I’m not an expert baker either, Audrey, so I don’t usually alter a recipe because I really don’t know what the results will be like. I’ve never tampered with this one. Sorry I can’t be of more help! We don’t do a lot of sugar around here either. In fact we use Stevia instead of sugar in all of our recipes! Now I have not actually made this particular recipe, but I make banana bread all the time and this is similar just cooked and cooled differently. When I make banana bread I use way less sugar than the recipe calls for, and sometimes I add no sugar added apple sauce as a sweeter and to make it more moist. So yes you probably can use as little sugar as you want, it won’t affect the way it bakes only the way it tastes! Same for the Icing, you can use less or no sugar for the icing as well. Our favorite icing is a coconut cream icing and we don’t put but a little Stevia in it! There really chemistry involved in baking. I’ve been baking my entire life and find most things turn out well for me. However, back in the day we stopped using sugar and I tried substituting honey in varying amounts. My baking went south. I’ve read that sugar actually contributes to moistness and crumb. Not saying you can’t make substitutions, but it will take some experimentation. finnished crust. Also Since the bananas are sweet, i reduce the sugar by 1/2 and it is still yummy . Can this cake be frozen ? freezer does not like hot! They’ll thaw out ??? I had the same experience. It took more like 1:30! I turned it up to 300 at the end and it finally cooked. I wonder if 275 is a typo? That’s awfully low for baking. It turned out super moist and tasty, but I have another banana cake recipe that I think is just as good. It bakes at 350 for 1 hr. Uses buttermilk as well. I may try putting it in the freezer for 45 minutes and see what happens! Oh, and my oven is only a year old! It’s always been accurate. Sorry to hear it took so long to bake, Carol. I ‘m not sure why that’s happened for a couple of people. Most of the people I hear from say they’ve been making it for years, or that they made it, and they love it. Only a handful have said it’s taken longer than suggested to cook. I wonder if it has to do with using fresh vs. frozen bananas? You make me feel okay. I am not a baker…but this sounded so good. It is baking as I am typing….so far it is cooking 30 min past the recipe time. hope it gets done soon !!!!! I always put my cakes in the freezer after the oven. It helps with frosting the cake as well as moistness! No it’sin Fahrenheit. In Celsius it will be 135 degrees. I just made this cake and it is FABULOUS! I did make some minor changes though. I used half whole wheat flour and half all purpose flour. I also only used 1 cup of sugar and it has the perfect amount of sweetness. I used a budnt pan and baked for 1 hour and 10 minutes as suggested and it was done perfectly. This will now be my go to recipe for banana cake. Yay! I’m so glad it turned out great for you with so many tweaks, CarolAnn! I’ve never even thought to try it in a bundt pan! Can you sub almond milk in other recipes you use? If so, I’m guessing you probably can. I wouldn’t know though. I’ve never used almond milk, nor have I ever tampered with this recipe. I used cashew milk with a tbsp of vinegar and it turned out great. I have some lactose intolerant family members. I did need to cook it for 20-30 mins longer than suggested at 275 degrees. I used fresh bananas not frozen ones. I had no overflowing as some others have experienced – perhaps over mixing the batter? Excellent recipe – Thank you. It spills over until you put it in the freezer and shrinks back perfectly. Just wondering, all listed ingredients in cups state cups. In the cream cheese frosting it states 1/2 C butter. Is that a 1/2 cup or is C something else please? Yes c=cup. Thanks for pointing it out. I’ve edited the post. I’m not sure how this would’ve happened to you. If you read through the comments here and on my fb page, people love this recipe. Some even say the cake almost over flows the pan. The batter, when you pour it into the pan would be deeper than 2.2cm, so how would it shrink. I do specify in the body of the post that it’s baked at 275 farenheit. I can add that to the print out as well. Sorry it didn’t turn out for you, but if you followed the instructions, I can’t think of a reason it would fail. Is it possible that you used baking POWDER instead of baking SODA? Wait – isn’t this a Canadian website? I’m Canadian, and whenever I make a U.S. recipe I need to adjust the flour. For every cup of American all-purpose flour called for, I measure 1 cup of Canadian flour and take out 1 tbsp. And if “wholemeal” is like our “wholewheat” flour, it can’t be substituted for an equal amount of all-purpose flour. I’m not sure what wholemeal is, Carmen. I often substitute whole wheat flour for All Purpose flour though. You’re right about me being Canadian, but I’ve never, in all my years of baking, heard of your tablespoon of flour trick. That’s news to me. I had little helpers who put the bananas in with the flour and the milk last….we’ll see! I use a pyrex dish, and I place it directly into the freezer, Rose. Um, Pyrex sometimes explodes on sudden temperature changes. I STRONGLY suggest using a metal pan, not any form of glass. I’ve heard too many stories, including from real people who I know, of hot Pyrex shattering and spraying shards of flying glass all over their kitchen when it cools suddenly after being in an oven. You can Google “exploding Pyrex” for more info. That is horrible, Tammy. I’m so sorry for your experience. I hope you took it up with Pyrex themselves, as it sounds like your baking dish was flawed. Pyrex, obviously, is intended for oven use. What was their explanation as to why it exploded while baking in it? I am not a very good baker/cook, but I will try this. I have a banana bread recipe that I tried and ended up throwing all 4 loaves away. They were not done on the bottom. I know I did something wrong, but what it was, I don’t know. I will not alter your recipe in any way, for the exception of a bigger dish to bake it in. Is that a good suggestion? Do they even make a dish bigger than what the recipe call for? Thank you! !!! I do have a larger dish. It’s massive, but I would think you’ll have to alter the baking time if you use a bigger dish because the batter will not be as deep in the dish. I’m not sure how much to tell you to alter it by though. You’d want to really keep an eye on it so it doesn’t burn. I’ve been making this same cake for a couple of years now. Yes, putting it in freezer makes it so very moist. The cake is delicious. I enjoy Cream Cheese frosting, but I have taken to making a Browned Butter frosting. It is so delicious!!! My brother-in-law has always preferred chocolate, but he requested this cake with Browned Butter frosting for his birthday cake last year. It’s such a delicate taste, and goes with the cake beautifully. I melt a whole stick of butter and let it brown slightly. Pour it into a small bowl and let it cool completely. 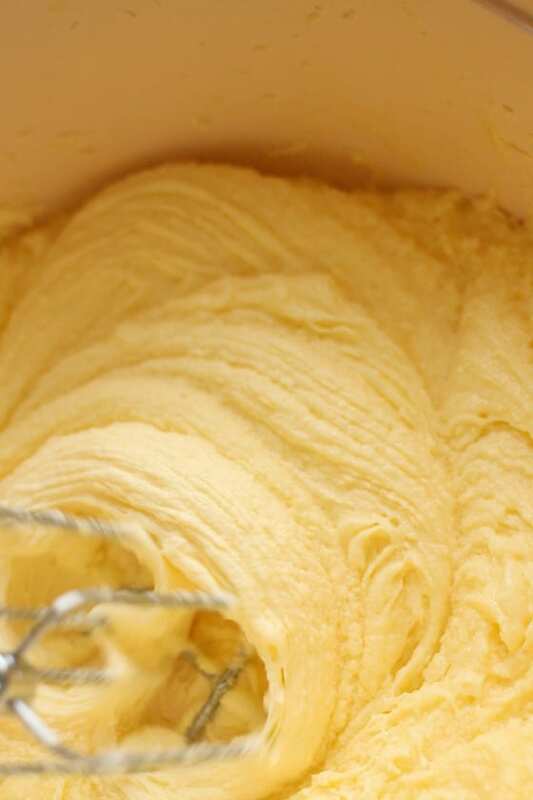 Then make a basic buttercream frosting substituting the browned butter for regular butter. Would this work for cupcakes? I believe so. You’d just need to alter the baking time. i just made this tonight into cupcakes and 2 smaller pans. it turned out great, the only thing i changed was to take the cupcakes out about 10 minutes early so about 60 minutes total. i let the smaller pans, i think 9×7, go the full hour and ten minutes and everything turned out amazing. thank you for the recipe i will be using this in the future for sure!! So glad you loved it, Alec! I need to try the cupcake version as well! This recipe would use up my whole year’s sugar allowance in one go…yikes!! 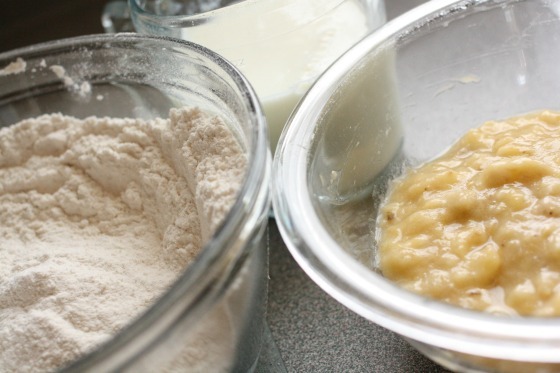 perhaps this was due to using plain flour – you need to use self raising flour for cakes to rise. No, it’s all-purpose (plain) flour that this recipe calls for. The baking soda in the recipe causes the cake to rise. I have it in the oven, it just finished it’s hour and ten minutes but still pretty wet in the middle so I guess I’ll leave it a bit longer! Smells amazing though. My edges already look completely done so hopefully they don’t dry out. I’m just took my cake out of the oven to and it was not cooked in the middle. What should I do ? Put it back in the oven, and check again in 10 minutes. Mine is always done in the recommended time, but you can add 10 minute increments if needed. can I use margarine or I have to use real butter? Margarine could yield different results because the consistency is different than butter. Lisa. I’m not a pro baker by any means, but I’ve always read that baking is science, and a recipe turns out the way it does because of the reactions/composition of the ingredients. It might turn out fine, but if you can, I’d stick with the suggested ingredients. I’m not an expert baker either, but it is a chemical reaction. Sugar lends moisture, flavor, and a tender crumb, so It’s difficult to reduce the amount and still maintain the integrity of the recipe. Margarine has a high water content, so this could also produce a different outcome. Adding whole wheat flour will produce a heavy cake with not as much lift as AP flour. Whole wheat absorbs more liquid. Use the ingredients that are called for in a recipe, especially for baked goods. This came out exactly as the pictures showed, step by step. I used butter milk I bought at the store, I didn’t make it. I also used a corning ware dish. Went from oven to freezer, without a problem. Moist and delicious, perfect easy too spend a rainy afternoon, baking this terrific cake. Yes, as mentioned, the cake is frosted, once completely cooled, AFTER coming out of the freezer. Did you tfrost the cake in the pan? How do we do this so someone can take this cake to their easter party. Should i remove it then frost it? A liytle confused. I always leave mine in the pan to frost it, Jessica. You could try popping it out by laying a large, rectangular baking sheet over the top and flipping it. You’d want to make sure the pan was well sprayed so it comes out nicely. Substituting ingredients and/or their amounts is not a recipe for success, esp. with a cake. This cake already is baking at a low temp, so futzing with ingredients isn’t really a good idea UNTIL you master the recipe as written. I haven’t tried this cake, but I don’t think you can complain about the recipe unless you’ve followed it to a T.
Once they were changing the gas lines in my street. Everything was supposed to back up and running. I decided to make a cake. The oven wouldn’t heat beyond about 200 F. I already had the batter, so I thought, what the heck, I have nothing to lose. I remember it took a LONG time to bake, but it was probably the best cake I’d ever made, super moist. Thank you! I agree completely! I rarely mess with a recipe. Baking is science, and typically, if you want the recipe to turn out exactly as it should, you need to follow the recipe exactly. Unless of course, you’re an expert baker, which I am not! Hah! Hi there! I’m about to make this cake for Easter dinner and I couldn’t be more excited about it! One quick question. Do you usually frost it while it’s in the pan? Or do you actually remove yours from the cake pan before icing? I want the presentation to be neat and clean. Glad you loved it, Janet! I wouldn’t use sour cream, but I tell you right in the recipe how to make your own buttermilk with milk and vinegar or lemon juice. I just made this cake and everything turned out great! The recipe was exact and the cake is delicious!! I made it in a glass Pyrex pan with no problems. Thanks for the recipe! This was amazing. My mom is gluten free so I used the rice flour blend. It turned out perfectly. This was beautiful, thick, and moist. The frosting was also delicious. I was out of vanilla so I used almond extract on the frosting and I think I will do the same next time. Fantastic! On the off chance that anyone will answer before I start mixing in the next hour…anyone subbed in any cake flour in place of some of the AP? I have both but I like to sub cake flour in my cinnamon rolls for lighter texture. Maybe it would lighten this one up with the dense bananas? Just curious. Thanks! Help, I forgot lemon juice at the store:( how essential is the lemon juice? I do have lemon essential oil, but not sure if that would work? Can I just leave the lemon juice out? Thanks in advance! I’ve never made it without, but I imagine you could, Kyann. For making the buttermilk, you can use vinegar instead of lemon juice. I have not, but others have emailed me to say they have. I’m not sure what the baking time would be. I would think it would be less, but you’d just want to check every so often to see when a knife comes out clean. This cake is a hit with my family. I made it last week and my husband went out and bought the ingredients because he just had to have it again tonight. Can we use cashew milk instead of buttermilk/regular milk? I halved this recipe (since it’s only me and my husband) and baked it in an 8X10 dish for the full 70 minutes and it turned out perfect! I also halved the frosting recipe but used 1/2 (of the 1/2) powdered sugar and 3/4 package of cream cheese and again it was perfect in taste and plenty enough to cover the cake! Thanks for letting us know, Marylou! This will be handy for anyone else wanting to make a smaller version. So glad it turned out perfectly for you! It could have been the 2 c of whole meal flour that you used. Whole meal produces a heavier baked product. The recipe calls for all purpose flour only. Thanks for all your insight, Vicky! I know it’s tempting to alter a recipe, but I’m always hesitant to. Like you say – it’s science. Every ingredient plays its own specific role in the formula! i just made this cake tonight. I truely is an a very delicious, moist cake! And so good with that wonderful cream cheese frosting! It was really easy to make too! I’ll definitely have to make this again! I started to throw those bananas away, so I looked for a recipe I could use them in. Yum yum!!! I had the same experience. Also it was so dense you had to stab it with a fork and break off a piece. Holy Cow, this came out UN BELIEVABLE delicious, everyone raved how great it was… I followed the recipe to a T and it came out great, serve it right to of the refrigerator when the icing is a bit cold and OMG.. you ll make this over and over and BTW I did make 6 cupcakes at a 10 minute bake time or until they looked done to touch and was dry if you placed a knife down the middle. ENJOY I just laminated this recipe so I don’t mess it up I want it for life. Sudden temperature changes with Pyrex has been known to make it explode! I’d make sure to use a different pan! This is the best recipe/method ever! I love trying out a new recipe and it turning out perfect, and this is one of those times! The only thing I did different was using half whole wheat flour and half brown sugar. The cake was super moist like promised, I’m really interested in using the lower temperature and freezer method with my cupcakes, they never turn out moist! Hi there! My family and I love this banana cake! How do you alter your other recipes, Hannah? I really have no experience baking at other altitudes. Sorry! There should be a pamphlet or list at your local Chamber of Commerce office. If not, they might be able to steer you in the right direction. We live at 6,200 ft, so I understand what you are saying. Actually, the only thing different I do when baking is add 2 Tbsp. of flour to my angel food cakes. I don’t do anything different to any other baking. I haven’t tried this recipe yet, but am anxious to! GREAT suggestion, Julie! Thank you! Hi, I’m want to make this cake for my mom for mother’s day, and I need to know a few things before hand though, she’s – according to the doctors: Borderline Diabetic, and I was wondering if I could use Agave for both the cake and the Icing? – and curious as to if there are any changes I might need to make to the recipe if I use all of Agave, … or perhaps I could just cut the sugar take in half with the icing, as 3.5 cups is too much, and even though she loves cream cheese, if I can’t use Agave in place of sugar for the icing, I might have to go without… of course, couldn’t I just use flour with the icing to thicken it up? Agave is a syrup, so that would not work to substitute for sugar in the cake. You can’t substitute a liquid for a solid (dry good) in a baking recipe. As has been mentioned before, baking is a chemical reaction – if you change the ingredients, you will get a different (usually undesirable) reaction. Some people used half of the sugar in the cake and had success, so you could try that. As for the icing….it needs sweetness to actually be icing. If you take it out, you’re basically just spreading butter and cream cheese on your cake, and that would not taste very good. Agave syrup would make it super runny. Also, I would strongly discourage you from adding flour to icing – it would likely taste terrible, unfortunately. If she cannot have sugar, may I suggest you look for a different diabetic-friendly treat? In general, iced cakes need sugar in order to taste good. They simply aren’t diabetic-friendly. Sorry auto correct pre1980 Pyrex doesn’t explode newer version does corning ware still is good it still has the ingredient that makes it okay for temperature changes . Thanks for that info, Cindy! Hi Jackye, thanks for sharing this great recipe. I had great results with it even though I made one big mistake. I love cooking meals but I’m not really good at baking. My biggest problem with baking is that I have a habit of miss measuring ingredients or leaving out an ingredient all together. So when making your cake today I added an extra half cup of flour. I realized my mistake after adding the bananas so I add a few extra tablespoons of buttermilk. The batter seemed fine so I divided it between two 8×8 foil pans and baked for 90 minutes and they were perfect!! Usually adding too much flour & baking in different sized pans would spell disaster but not with your recipe. Thanks again. Haha! You make me feel better, Judy. I frequently mis-measure or leave a step out when I’m baking. I’ve learned to roll with it, and I’ve had a few happy inventions in my time as a result. Hee hee! So glad you rolled with your mistake here, and really glad that you were happy with your results! I will be doing a layer cake. How firm or dense is this cake? I’m wanting to split the 8″ rounds in two to add more layers for a naked cake. Will it hold up being cut through the middle? this cake turned out light, moist and delicious. I baked cupcakes and cake at 325 degreees (cupcakes 30 minutes and cake 40-45 minutes), cooled frosted and served (didn’t freeze) and it is fabulous! Yay! So glad you loved the recipe, Jacqui! I must try cupcakes some time! Hi there, this recipe sounds divine! I’m going to try making it with a mix of almond and rice flour (my whole family are coeliac), so will let you know how that works out… Hopefully will be just as delicious! can someone please tell me ASAP if I could cook some walnuts in this cake, I’m wondering if it will mess up the integrity of the cake? and I really would appreciate only knowing if somebody has actually done it or not. Can you buy lemon concentrate, Tammy? That’s what I use rather than real lemons. You know… it’s like a little plastic lemon filled with juice? We also can get it in a bottle. I’m not sure how limes would affect the flavour, but you could use vinegar to sour the milk. Followed the directions exactly and the cake and icing were perfect. Really great cake. Was a big hit! Will make again. Hooray! I’m so glad you loved it, Gramma Di! I am always looking for ways to use up bananas since we buy in bulk twice a month and sometimes they go bad faster then we can just eat them. So always looking for ways to use bananas. I made this cake today it is so good. I did add walnuts to it and it came out great! Thank you for this recipe! Has anyone tried making this into cupcakes or two round cakes? Id like to try this for my son’s birthday. I think I saw other commenters say that they had, Aubrey. It looks wonderfull but is there anyone to translate the recipe in french. Thank’s for your help. This looks delicious! I can’t wait to try it! What a great way to use up ripe bananas too. I have made this very cake for years and it always gets rave reviews. I would not change the icing but perhaps cut the amount down a smidgen. I use coconut extract in the icing rather than vanilla. Same for Pineapple cake. I live at 7600 feet above sea level. Any suggestions for altitude adjustments? Sorry, I can’t help you there, Brenda. I wouldn’t know where to begin. What kind of adjustments do you normally make to your recipes to accommodate for your elevation? Table 3: Cake-recipe adjustment guide for high altitude. Adjustment 3,500 to 6,500 ft. Adjustment 6,500 to 8,500 ft. Adjustment 8,500 to 10,000 ft.
Reduce baking powder, for each tsp., decrease:	1/4 tsp. Reduce sugar, for each cup, decrease:	1-3 Tbsp. Leavening: Measure accurately and reduce alike both baking powder and/or baking soda. Increase baking temperature by 15 to 25 degrees F to help “set” the batter before cells formed by the leavening gas expand too much. 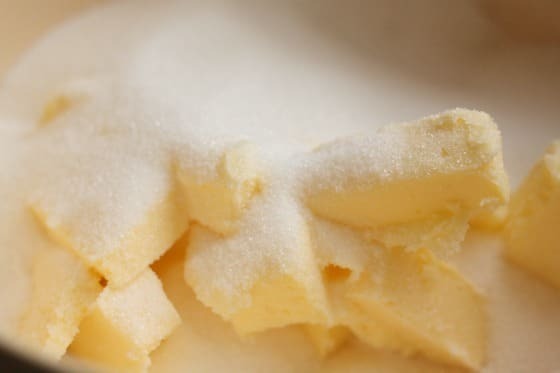 Excessive evaporation of water at high altitude leads to high concentration of sugar, which weakens the cell structure. Therefore decrease sugar in the recipe and increase liquid. In making rich cakes at high altitudes, you might have to reduce shortening by 1 or 2 tablespoons. Fat, like sugar, weakens the cell structure. 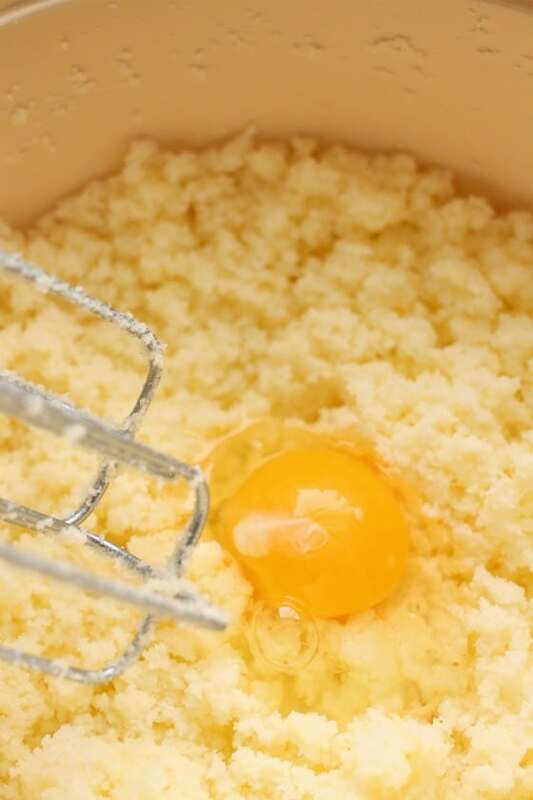 Also, increasing the amount of egg strengthens the cell structure and may prevent the too-rich cake from falling. Way to improvise, Sandra! Well done! And great to know you can ripen bananas so quickly like that! Aw, I’m glad you’ll try this one, Sandy. I hope you enjoy it! how do you store this cake? Does it have to be refrigerated? I don’t refrigerate it, Jenn. It doesn’t last long enough here to need it. A couple of days on the counter is fine. I suppose if you were keeping it longer than that, you could put it in the fridge. I think others have done the cupcake thing, Tamela. I don’t think they’d have to be in the freezer too long because they’re going to cool much faster than a solid cake. You’ll want to bake them for less time too. Scroll through the comments on the post. I think there are others who mentioned they’ve made them as cupcakes. Can you add cocoa to this recipe to make it chocolate banana cake? If so, how much and when should I add it? Yes! I’ve seen that post too. Hilarious!! would it be possible to leave the cake in the freezer, if don’t need it for a few days?! Then thawing later to ice? Or ice before frozen, just cooled? I suppose you likely could, Lori. I’ve never tried it, but I’ve frozen box-mixed cakes before, and defrosted before decorating. i just made this and frosted it. I followed the directions closely but used smaller loaf pans (glass) since I didn’t have the 9 x 13 baking pan. It took 15 min longer than the time stated in my fan oven and I had increased it to 140c. To make the frosting, I started adding a half cup of icing sugar and by 1-1/2 cups, I liked the taste but decided to go a bit sweeter. Two cups I found too sweet for my liking. I can’t imagine how sickly sweet it would be after 3-1/2 cups. So, you may want to taste after each 1/2 cup addition. Also, it wasn’t stated to sift the icing sugar first not did it state that with the flour, salt and soda. If you don’t want lumps in your batter or frosting then sift first. I haven’t tasted it yet but I’m sure it will be great! can I bake this in a 10 x 13 non stick pan ? I bake all my sheet cakes in this pan & I also spray it with bakers joy spray ! Never had any problems ! I had a bunch of bananas on my counter that were going to go bad very soon. Then, I saw this recipe posted on someone’s facebook page. An added bonus was that I had all ingredients on hand! It was a sign that I *had* to make this cake! Let me tell you – I believe this is the BEST dessert I have ever made and my whole family agreed. I’m known to make banana bread with ripe bananas, but this will be my new staple. The icing sends it over the top! Thanks for sharing! (I followed the recipe exactly – and added 10 minutes to the cooking time). I made your crazy good banana cake and while it was delicious and my people loved it I was not so pleased. It was very dense not fluffy. It was moist though. What could I have done wrong? I don’t think you did anything wrong, Ellen. This cake is definitely dense. Yay that it was delicious, and that your people loved it! Sounds like it was a hit! As Im in Australia & our measures are a little different can I just confirm the measures you are using are the following. Dry ingredient measures: 1/4 cup (50 mL), 1/3 cup (75 mL), 1/2 cup (125 mL), and 1 cup (250 mL). Measuring spoons: 1/4 tsp (1 mL), 1/2 tsp (2 mL), 1 tsp (5 mL), and 1 tbsp (15 mL). Yes, that all sounds about right to me, Michelle. My husband and I just finished a piece of crazy banana cake and I just want to write and tell you that this is my new go-to banana cake recipe. It was fluffy deliciousness! Thanks for a great recipe. Yay! Glad you love it! At what temperature and for how long would you bake it for 2 9 inch round pans? I used a 9 x 13 pan but overflowed during baking. It took a lot longer than 70 min. more closer to 120 min. I kept it in the freezer for over an hour (my cat just didn’t want me to get up) and the cake was cool but the bottom of the pan was a touch warm. Otherwise great tasting cake, as soon as it was frosted I ate a piece. How big is one cup of sugar? Is this like a regular 8oz sized cup? Or is there a particular type of cup this recipe is referring to? May I also ask, does .ca (in the hyperlink) stand for Canada or something? It’s just in case location differences play a role in how this turns out! I know that Fahrenheit is of course not what we’d naturally use in the UK. Just thought I’d post an update on how the cake went. It was soooo good! Everyone loves it (except my sister who is deliberately picky…). Had a lot of tasters and they give a thumbs up. It makes so much, so I have had more than I should! Not good when you’re trying to eat healthily. It’s really hard to stick to one piece! I’ve ate some throughout the day, but I can imagine that it’d be quite sickly if you overdo it! The icing is great! Maybe my favourite part. Took way longer than 70 minutes for me. The centre didn’t seem to want to cook like the outsides. Might be the oven. Hate our oven! Just to note. I remember seeing a comment that said it didn’t rise. I’m from the UK and I used bicarbonate of soda, which is basically baking soda. And plain flour. Awesome recipe but too much sugar for me. Cut sugar in half and increased banana to 2.5 cups and turned into great super moist banana bread. You can make this in any shape of pan you want just make sure you only fill the pan 1/2 full and adjust your baking time. Love recipes I can use in multiple ways. Do you think I could substitute zucchini for bananas and add some cinnamon? Yes, I’m still trying to use up my zucchini! Happy to help, Christine! Hope you love the cake! I couldn’t agree more. I chose this recipe for exactly that reason! Can this cake be made as a layer cake? I would imagine so. You’d just cool the two cakes in the freezer, and then somehow remove them from the baking dishes/cake pans. I’m not sure how that would go though, as I’ve only ever served it in the dish. I followed your recipe exactly as you had it and even had to make the milk soured with one tbsp vinegar ad it turned out PERFECT.. this is one I will be using again and again.. thank you so much for sharing it. Yay! So glad you loved it, Jolene! Isn’t that little milk and vinegar trick wonderful? I never have buttermilk on hand, so I use that trick a lot. It went into the freezer great, but when I took it out the center was all sunken in. About 3″ around the rim was find but not the rest. Any idea why? It was in there longer than 45 minutes b/c I went out. Maybe 90 minutes. Would that do it? Hmm. I’m really not sure, Valerie. I’ve never had that happen, and so many others that have commented on my post make it all the time. Did you do the “done” test? I’m wondering if it wasn’t fully cooked in the center? this cake is amazing< a must try!!! If you put the cake directly into the freezer won’t it melt everything else in freezer? What’s the advantage to freezing for 45 minutes rather than cooling on countertop? Hi- I made this gluten free and it was fabulous! I’d like to make this recipe in cupcakes for my daughter’s baby shower. Have you tried that and if so how long did you or should I bake them? Thanks so much!!! I haven’t tried it, but I think some others in the comment thread have. Have a scroll though, and they may have given details, Kathleen. Glad you loved it! Yay! Glad you loved it, Cindy! In our office, the birthday person gets to request what kind of cake they would like. I like to bake, so when she said, “can you make a banana cake?”, I thought “thank God for google!”. Picked the perfect recipe. Crazy? just a little, but PERFECTION! Even the dieters broke rank and came back to sneak a second piece! Had no trouble with the Pyrex. It did take much longer than 70 mins, but I just kept going in 10 min increments until knife came out clean. This is a keeper!! Yay! So glad you and your co-workers loved it, Joanne! Hi! Should I use salted butter or unsalted butter? The best ever banana cake I have ever tasted. Made it last evening, followed the recipe without any changes and it was perfectly moist. I read all the comments and left it in the oven after switching it off for an extra ten minutes. My kids loved the cake, also shared it with my boss and colleagues and was very happy with the compliments.My husband was away so has not tasted the cake yet. Thank you for the recipe. This cake will be one of our family favourites. Yay! I’m so glad you all loved it, Monica! Yummm! Perfect texture and cooked perfectly throughout. (I often have a problem with banana loaf being underdone in the middle.) I would have liked even more banana taste, next time will use bananas that are more overripe and measure to make sure it is 1 1/2 cups. I will probably add toasted chopped walnuts too. Icing tasted good, but was sticky and pulled crumbs off top of cake. Maybe wait longer after taken out of freezer before icing? Wanted to rate it 4 stars, but it went to 5, and there was no way to correct it. Will definitely make this over and over! This recipe is dense enough to work well at altitude (I’m at 6600′). No changes necessary. You did a good job of explaining each step and the photos were a nice touch. This cake will be replacing my carrot cake as my ‘go to’ dessert favorite. Thank you for the post! Thank you for your support and praise, Paul! Glad you enjoyed it as much as we do! I don’t know what 3.5 cups of powdered sugar is ! Three and a half cups (8 ounce cups) of confectioners sugar. Can you make it into muffins? I think some folks have, Kym. Scroll through the comments. I believe a few have shared how it’s done. Hi! I made this today for work. I accidentally baked it at 350 for the 70 minutes and all worked out well! I also used gluten free 1-1 all purpose flour with no problems. I did leave it in the freezer a while longer as it just wasn’t cool. I added a tsp of cinnamon to the icing and topped with honey roasted pecans … YUMMY!!! Will definitely be making again. 🙂 Thanks for sharing – can’t wait to try other recipe! I am always looking for delicious new flavors to build tiered cakes with and I would love to do this flavor in a multi tiered cake. How does it do when layered? Is it fluffy enough to hold the weight of a layer on top and have you ever made it in a 4″ deep round pan? I hope you love it as much as we do, Dorian. It’s the best! I made this cake today and like many other people, had problems with it baking. I used frozen bananas and I think that’s what the problem could be. After they thawed out they were very watery and mushy (I should have just thrown them away). Perhaps this was the reason behind others’ cakes being so runny while baking? Just a thought. Have had the cake when fresh bananas were used and didn’t have any problems at all, definitely recommend avoiding the use of frozen bananas. Help! I left cake in freezer longer than stated and now its frozen solid. Did I ruin it? I think it should be fine if you thaw it. Many grocery store cakes are frozen before they’re decorated. Has anyone made this into cupcakes? If so, what was the baking and freezer time that worked the best? Also, how much batter did you put in the baking cups? How much did they rise? Absolutely lovely recipe. I put about 1 and 3/4 cups of sugar and didn’t find it that it lacked sweetness. I also made about half of the frosting which was the perfect amount for my taste. Thank you for sharing! My daughter has an egg allergy, anyone have any success or suggestions with replacing the egg with this recipe? Icing is so thin I think I would use a thick, creamy cream cheese frosting instead of icing. Icing is what we call frosting here in Canada Wendy. I’m not sure if you can’t see the photo for some reason, but this is a thick, and creamy cream cheese frosting. If you want it even thicker, you can double the recipe. I made this cake last night to take to church this morning. I baked it in 2 eight-inch cake pans and had enough batter left over for 6 cupcakes. With my oven at 275 the cupcakes were done in an hour but I left the 2 round pans in for the full 70 minutes. Because it was time to go to bed when I put the cakes in the freezer, I just left them there overnight. The round cakes were a little difficult to get out of the pans this morning despite my having sprayed the pans with Pam, but that might have been because they were still partly frozen. HERE’S MY BIG SUGGESTION: I used to bake a banana cake with peanut butted frosting, so I substituted peanut butter for the cream cheese. Probably was a bit too much peanut butter but it still tasted great! A little milk in the frosting might have made it fluffier. The cake is very moist which I guess is why it is so heavy, but the folks at church seemed to like it and I saw at least one person go back for seconds. try a thicker font, this font is very thin, and hard for people with not perfect eyesight to see. DO NOT USE A PYREX DISH. Pyrex is very liable to suddenly burst and shatter in any extreme change of temp. Use a metal pan. You can google pyrex shattering. Also Never put hot pyrex directly on a counter. Put a potholder under it. This cake recipe went over SOOOOOOO well with my family and me!!! The best that I have ever had. Thank you for this recipe. I’m going to try your carrot cake recipe next. By the way I didn’t put it in the freezer because we couldn’t wait to tear into it!! LOL!! I tried this menu a month ago and it turned out amazing the cake was so moist! Of course i added my own twist to it (Nutmeg, shredded coconut and Raisins) my nieghbours loved it, and even suggested i make and sell it…lol! Anyhow, thanks for sharing this recipe. I just did another and placed it in the freezer… looking forward to it! The icing turned out awesome too. Also, I poured it into the pan and in one half I sprinkled walnuts on the top, on the other half I sprinkled some chocolate chips, then gently mixed those into the batter and it baked up perfectly. I love walnuts, husband loves chocolate chips 🙂 Sorry, don’t have measurements for those, I just eyeballed. I’m so glad you and your co-workers enjoyed it as much as we do! Thanks for the feedback. Love your kitchen sink trick. That’s pretty extreme! Thanks for the recipe. The cake is still baking,smells great. Used a 9X13, but the cake has overflown a bit and it has been well over the 70 minute mark. Eek. I don’t know why it takes longer for some. I guess our ovens are all a bit different. I hope it didn’t over-flow too much. I’ve never had that happen. Hope it tastes awesome just the same! I cooked this exactly as written though I let it cook about an hour and 30 minutes until it was almost a dark brown. It was DELICIOUS. My husband and daughter lived it. Perfect! This is by far the best banana cake out there. I have done many things to modify it and it continues to be delightful every single time. I have subbed Half and Half for the buttermilk or coconut milk (adding the vinegar). I have used some applesauce in place of some of the butter (not all). I have added crushed pineapple, dried cherries, mini-semi sweet chips, chopped walnuts, pecans, etc… I have omitted the frosting and topped with whipped cream or just sprinkle with powdered sugar. I have reduced the sugar to 1 cup. For a real treat, skip the frosting. top with a shaving of vanilla ice cream. fresh whipping cream, chopped walnuts, dark cherries, pineapple then drizzle with chocolate syrup. If I owned a restaurant, this would be on my dessert menu and would be a top seller. Thank you for sharing it. p.s. I always freeze ripe bananas then thaw them for use. I’m in Canada, Laura, and we don’t get our butter in sticks here. They do in the US though. A cup for me is 8oz. I’m not sure what it converts to in weight, but if you’re using a measuring cup, it would be the 250 ml mark. Our butter comes in a rectangular block, Riobha. Imagine putting 2 sticks of butter side by side, and then another 2 on top. That’s pretty much what our block of butter would look like. Actually, we do get them in sticks too :). I also live in Canada, and it just depends on what brand you buy. I like to get the PC brand from Superstore (Loblaws, if you’re from the east), and they come in four sticks in a box. Almost forgot… is baking soda the same as baking powder or Bi-carb soda? Same as Bi-carb…not the same as baking powder. So I made this a couple of days ago and I love it but I just realized that I have left it out on the counter since I made it. Do I need to dump it or is it okay? I didn’t even think about the cream cheese frosting! This is one of the best cakes I’ve ever made or eaten! Cake is moist and delicious and icing is so good i could eat a whole bowl. Made it following directions using lemon juice in milk instead of buttermilk, omitting salt, baking for 62 minutes and putting in freezer for one hour. Perfect! Thank you. Can I make this cake and freeze it for a couple of weeks before serving? I would think so, Karen. I would let it cool completely, and then cover it tightly in plastic wrap and then foil. I’ve frozen other cakes this way before using them. We aren’t big fans of cream cheese frosting. What would you recommend as a substitute? I’ve made many cakes. This is the best! I added walnuts to the recipe and found that I only needed 1/2 of the icing. This is a keeper! I’m glad I found this recipe. I had 3 really ripe bananas, just enough to make this. I usually make banana nut bread but it can be a bit dry. This is really moist and tastes great. Thank you for posting it. You’re welcome, Nancy! I’m so glad you tried it and loved it! This isn’t “cake” per se, but a pan sized banana bread. It was moist and cooked just as directed but not the fluffy banana cake I had been hoping for such as the kind from Roses or even QFC. Interesting. Perhaps our breads and cakes differ from country to country. Here in North America, this is more a cake than a bread. If you’re using a newer pyrex dish it won’t shatter (apparently the older ones can), but feel free to bake in a metal pan if you have concerns about the glass. I made this cake last night.. It actually took an hour and a half to bake, and it overflowed my pan and landed on the bottom of my gas oven. I’m thinking a larger (than 9 x 13″ pan) would be more appropriate. I make it often, Lori, and always in a 9×13 pan. Is it possible that you used baking powder instead of baking soda? That would cause the batter to expand. Or perhaps you used self-rising flour instead of all-purpose flour? Self-rising flour has baking powder added to it, so the batter would likely expand if you used that as well. Can this recipe be used to make cupcakes instead? I haven’t tried that, but I imagine it could be, Tania. Has anyone tried fully freezing this cake in order to use it later? I haven’t, but I imagine you could. I’ve frozen other cakes before. Hmmm. I’m not sure. I’ve never had that happen before. For the cake is it granulated sugar or caster sugar?? I made it in two round pans and I am about to cool it in the freezer. Can I pop them out of the rounds and then frost them stacked after the freezer? I’ve never frozen a cake before! Yes, just proceed as you normally would, Sarah. You’re not freezing the cakes, you’re just cooling them in the freezer. This cake is one of the most delicious I’ve ever had! I grew up on Sara Lee’s banana cake and this was just like it, only probably healthier! It was sooo moist, even though I used 1 cup wheat flour in the batter, along w/ the 2 cups white flour. This makes a good amount of batter and after reading the reviews, I chose to use a 10X14 metal pan and it still came out nice and high but did not overflow. Also I put the oven on pure convection and it took exactly 70 minutes. Because I so love bananas, I mixed a small thawed one into the frosting– OMG, soooo good– also only used 2cups of confectioner’s sugar as the banana made it nicely sweet! You are so welcome, Monica! I’m glad you loved it! Banana in the frosting sounds great! And oh, how I loved Sara Lee too! Our has never lasted long enough to need refrigeration. For a day or two, I store it on the counter. I’ve made this cake a few times and I absolutely love it. So moist and delicious. So I shared the recipe in a Facebook cake group and all of a sudden I was told you are not supposed to freeze cakes directly from the oven. It changes the temp of the freezer and could potentially cause other food to thaw a little and start to create bacteria in those foods. She even told me to check my fsa guidelines. I think its bull. What do you think of this? Some ppl say it’s ok, others say it’s a no-no. I liked the results very much, though I expected it to be more dense. I baked it for 1 hour 20 minutes at 275 degrees. I thought that temp was a little odd, but the results were fine. Thanks for this recipe. I’m in New Zealand and everything worked fine for me. I believe I may have cooked for a little longer than stated. Put it in the basket of my deep freezer on a towel and it was so yummy when eating. My husband doesn’t really eat cake and he enjoyed it too. The big thing was my EXTREMELY picky toddler tried some and now wants it for her birthday cake at the end of the month! But she doesn’t want “the white stuff” on it. I’m going to make it and her baby brother’s cake ahead of time then once cooled wrap in cling wrap/Gladwrap until the day before their birthday’s to ice and put in the fridge overnight. I’ll remove about 3 hours before party to warm up a little. Next time I will use half the amount of icing as it was quite a lot. It didn’t look it until I started icing. Could be the right amount if you did a thin layer to crumb coat then pipe roses/swirls on it. Thank you for sharing this amazing sounding recipe…can’t wait to try a piece after dinner tonight. My cake is out of the oven and just now taken out of the freezer. My question is this…it is still extremely hot on the bottom of the pan coming right out of the freezer. Should I let it cool more in the freezer or only in the freezer for the posted 45 minutes? Right now I have it sitting on the stove cooling more. Thank you. mine turned out disgusting. I was so dense I could hardly get a fork through it. I also had to bake it half an hour more just for it not to be liquid anymore. I checked the recipe over and over and I did everything I said. I’m really confused. I’m confused too, Taylor. I’ve had hundreds of messages and emails about this recipe, and no-one has ever said it hasn’t turned out. I’m not sure what went wrong, but something must have been mis-measured, or an incorrect ingredient used. I had that happen one of my cakes when the bottom element of my electric oven burned out and I didn’t know it. I was bummed! Ruined Thanksgiving dinner I’m going to try this recipe tonight for two coworker’s birthday celebration tomorrow. Hi! I’m wanting to half the recipe and it looks okay to do so except for the “3 eggs”. Should I use one or two? I’m not really sure, TL. I’ve never halved a recipe with an odd number of eggs before. I’m not entirely certain how the recipe will turn out if you halve it either. I really don’t know what advice to give you other than to suggest you “google” your question. You might find a chat forum that’s discussed how to halve a recipe with 3 eggs in it. Has anyone thrown in some chocolate chips in this cake?..I’ve had this cake a few times and it’s delicious but when I make banana bread I always throw in some chips…I love banana and chocolate together…may just give it a try…. Followed the recipe exactly, turned out perfect! Thick, moist & delicious! ** only difference for me was, it only needed 60 minutes in the oven at 275 degrees fahrenheit – bonus! I used a Pyrex 9 X 13. One of the best cakes I ever made, I added chopped walnuts to the batter and to the icing…just lovely! Yum! I’ll have to try that next time, Sandy! I’m so glad you loved my recipe! I made this cake for my sister’s birthday. I followed the recipe exactly. I used the buttermilk too. I have to admit I was really nervous about it possibly not turning out. This was the most delicious cake I’ve ever had. Everyone at the party loved it. I will definitely be making this again. I was wondering how do you measure1.5 cups milk what does the measurement equal same with3.5 cup powder sugar when it comes to math i am lost want to make the banana cake have it started in a pinch. Very good 5 stars!! I didn’t have buttermilk, used milk (1%) and lemon juice. Also used a metal 9×13 pan. Everyone loved it!! I like how dense it is. Very moist!! Awesome! I’m so glad you loved it, Suzie! Hi I am from Australia and followed the recipe to a T (added extra cooking time) and it turned out amazing, I now use it as a layer cake with Fosters Frosting (brown sugar and rum) everyone loves it!! Hi.. How do you make your brown sugar and rum frosting? Sounds really good. I’m American so I use ounces and cups, if that helps. Thank you so much. I’m not sure, Karen. I’ve never made brown sugar and rum frosting. The frosting in this recipe is a cream cheese frosting. Did you try googling it? Hi I am in australua and I am finding it hard to understand this recipe. I am not a good baker at the best of times but I really like the look of this banana cake. Any chance anyone can put this recipe into Australian measurements pretty please. I’ve been making this recipe for years. It actually bakes better at 300. But yes, the freezer part keeps it moist and delicious. I’ve never had too much batter for my regular cake pan. Are people putting the frosting ingredients in with the cake ingredients? Some of the comments lead me to believe people are confused about the instructions. The cake cools in the freezer. After you take it out, it never goes back in. Dont confuse baking soda with baking powder. This recipe is fantastic! Easy as can be, and so delicious! I took a hint from some of the commenters here and bumped it up to 300 degrees F, turning it down to 275 after 45 minutes. I also had it in the oven for a total of 1 hr, 25 minutes and that seemed to do the trick. Came out perfect, and my banana bread fanatic boyfriend loved his birthday cake! Thanks so much! This cake is delicious. I do not like to cook or bake, so to make this cake, one knows that it is good because it takes me a long time to get it in the oven!!!! This is the second time I have made this…the first time I used very very ripe bananas….took 30 min. longer to completely bake. This time I used banana just beginning to ripen…20 min. extra. but well worth it. I use canned cream cheese frosting (remember I do not enjoy working in the kitchen 😉 ) That works fine. Also about freezing. With only 2 people in the house, we really don’t need a large cake. I cut and freeze 2 slices per package. Works great…..weeks later, when we are hungry for sweets, Out of the freezer it comes and it is delicious. This cake sounds delicious! I have the bananas but not the cream cheese. That can be remedied easily enough. I was talking to a professional baker a couple weeks ago and she told me that lower temperatures and longer baking times help keep cake/cupcakes more even on top instead of rounding up. Aha! Interesting! Thanks for the tip! Have you ever made this is round layer cake pans? I am wondering which would work the best 8 or 9 inch? I haven’t, Martha. I’ve only used the 9×13 pan. I’m really not sure if one would be better than the other. I’m thinking either would likely be fine. I just made this cake and it is seriously the best banana cake I’ve ever had! I am not a baker normally so this recipe took me forever to make! I started around 1030pm and it was done and ready to eat around 1:30am! But well worth it!!! I followed the recipe exactly except I ran out of milk and needed another half cup so I used half and half and milk and added lemon juice to sour. I also was a half cup short on sugar so I added some light brown sugar. Everything turned out perfect!!! It did take me an extra 20 minutes to bake in top of the 70 minutes. Again. Well worth the wait 🙂 I am going to store in the fridge covered do u think It will be just as moist in a day or 2??? Thank you for this recipe!!! If you keep it tightly covered it should be, Izabela. I’m glad you loved it so much! I love this cake and so does the family. My granddaughter saw it on facebook and wanted to try it… It was wonderful. I am making one right now for church tonight…. Also I saw where someone made a comment about hight altitude… I live at 6,500 feet and did not change anything in the recipe. It was great, only had to cook it a bit longer but that was all. This is a fabulous recipe. Yay! So glad you loved it, Vicki! Glad it worked out at the higher altitude too! This sounds like a great recipe. 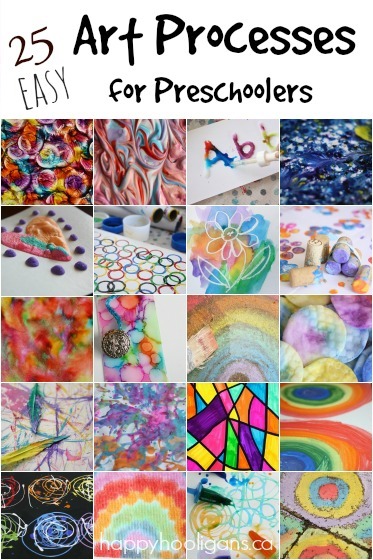 I’m plannning to make it for my daughter’s birthday. Do you think I can cut it in 2 without much trouble, and use half of the frosting with some banana slices in the middle? Hmm.. Good question. I’ve never sliced a large cake in half to put frosting in the middle. I’d probably be more likely to do 2 round cakes, and stack them, but if you have experience cutting 9×13 cakes this way, you’ll probably be fine? I plan on making this for my daughter’s birthdays cake. I was hoping to make a two layer round cake. Will I need to double the recipe for two 9″ round pans? Also, does this work for cupcakes? I would imagine it would work for both, Nicole, but I’ve only made the 9×13 cake. If you use bananas from the freezer, thaw & let them get to almost from temperature. If you use them cold it will take longer to bake. Aha. You’re brilliant! I wonder if that’s why some say the cake takes much longer to bake! Can I make cupcakes with this instead of a cake. Sure! I’m not sure about the baking time, so just keep an eye on them. 8 oz cream cheese (how do i get/make cream cheese. How do u interpret 3.5 cups to a learner. Cream cheese is a dairy product found in your grocery aisle, likely near the yogurt and sour cream. Oz means ounce. For the 3.5 cups: one cup = 8 ounces or 250mg. Hope that helps, Josephine! I am gluten allergic so I set out this morning to alter this recipe to make it gluten free for a block party. To make it gluten free, I followed the directions exactly with the following alterations: substituted Better Batter Cup For Cup flour for 2 of the cups of flour, and Bob’s Red Mill GF One-to-One Baking Flour for the 3rd cup of flour, used half almond milk and half regular 2% milk (and curdled it slightly with lime juice, b/c I didn’t have lemon), upped the liquid by 1/4 cup, used a 1/3 less cream cheese in the frosting (but upped the butter a little), and added a smidgen of cream to the frosting. In my gluten free world, where treats are truly treats b/c I don’t have them very often, this is pure heaven!!!!! SO moist and absolutely delicious!!!! Now the problem is that the block party was cancelled due to the weather and I have cake that is so good I want to eat it for breakfast, lunch, and dinner….lol. I suspect one could play around a bit with the sugar to make it a little less carb heavy, but since I rarely eat these things, I’ll relish in it just the way it is, thank you very much. smile emoticon:) The website gives it 2.5 out of 5 stars (which I cannot even remotely understand! ), but I give it more than 5 stars, if there is such a thing…lol ! FANTASTIC! Has anyone tried these as cupcakes? Any changes to the recipe or cooling process? I’m gonna experiment this weekend, any tips appreciated! 1. Didn’t have lemon juice on hand so I subbed it with orange juice. 5. Reduced the icing sugar to 2 cups rather than 3.5..added a little bit of orange juice to lift the frosting. PERFECT BANANA CAKE. YOU NEED TO MAKE THIS.Everyone loved it. Wow! You’re brave to make so many alterations to the recipe! I’m so glad it turned out so well, and that you love it so much! Thank you for your rave review! I’ve made this cake twice now and both times I used both baking powder and baking soda baking powder at 1tsp. Only and it came out super moist and have gotten wonderful reviews and request to bake for a friend’s mother’s brunch she can’t stop talking about how good it is. So for any of you who would like a little taller cake it’s ok to use baking powder just make sure you use the soda as well. Thank you for such a wonderful tasting cake recipe it truly is the best. You’re so welcome. I’m glad you love it as much as we do here! Hi…I am going to make this cake (sounds amazing). I was wondering …when I place the cake in the freezer…can I leave it there until I am going to frost it…say in a couple of days? We are going camping and I want to bring it along and then frost later on. I’ve had other readers say they’ve done what you’re planning to do, Linda. It should work out well. Hope you enjoy it! Just made delecuise, yummy . This cake is delicious! 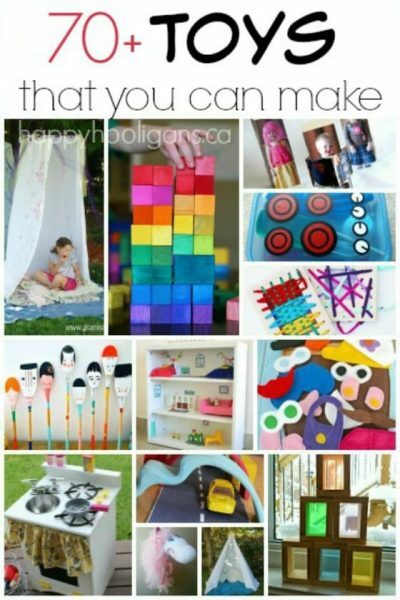 It’s easy to make as well. The hardest part is waiting for it to come out of the freezer. I followed the directions exactly and my 2 1/2 yr. old grandson helped mash bananas and measure the ingredients. Thanks for a great recipe! I think you can probably use any kind of icing you like, Neetu. Just be sure to refrigerate it after serving if you’re using whipped cream. On the recipe that came on my Facebook site the ingredients called for baking powder only. I put it in then noticed on the instruction part that it only said baking soda so I used it too. I suspected because of the buttermilk that baking soda was the right ingredient but after the fact. Anyways its turned out fine with both added. Hi Jane, I’m curious as to where you saw baking powder listed in the recipe? As far as I know, I only mention baking soda (in the first ingredient list, again when I’m describing how to make the cake in the body of the post, and again in the printable version at the bottom of the post. You mentioned that you saw baking powder listed on your facebook page? I’m wondering how that could be. Wasn’t it just a link to my post that you saw on your facebook page? There wouldn’t be an ingredient list showing up in your newsfeed if I (or someone else) simply shared the link to my cake on facebook. Hi all, I made this cake today and the only thing I did different to the recipe was to use I cup white sugar and 1 cup brown sugar in lieu of 2 cups white sugar. It turned out great. Yes it took 20 mins longer to cook but my wife says its one of the best banana cakes she has had. it is extremely moist and delicious. I am from Australia and followed the recipe measurements to a tee. Thanks this is one I will be baking for special occasions. You’re welcome, Rob! I’m glad you and your wife loved it! Made the cake today and it came out so delicious!!! Thanks for the recipe!! By any chance would you how many calories are in a slice? Glad you love it too! I don’t have a clue about the calories. Sorry! I think there are websites that you can enter ingredients into, and they’ll calculate the total for you. Then you could divide that total by the number of slices you cut the cake into. I just made this cake and it is FANTASTIC! I would not change a thing. I did use three baking pans and made a layer cake out of it. I cooked it the same amount of time. It turned out moist, delicious and pretty. I used to love an iced refrigerated banana cake by Sara Lee and this totally reminded me of it, ONLY much better..hello homemade! Cant beat that! This is a new favorite for me! thank you for posting such a wonderful recipe! By the way, I am a cook not a baker and I did not screw this up, it was easy! You’re so welcome, Lora! I KNOW, right? It’s so easy and it tastes amazing! I’m so glad you love it as much as I do! I have been making my mother in laws banana cake, which we love, for years. However, I saw this recipe and it looked great so I tried it. I am so elated that I did. It’s now my favorite. Moist doesn’t even describe it. One piece simply leads to another. Oh, I love this comment, Michelle. If you don’t mind, I’m going to quote you when I share my cake on Facebook. I followed the directions with one addition. I added one and a half cups of chopped pecans to the batter. Baked as directed and it was delicious. Pecans make everything better in my opinion. I agree, Barbara! They do! Does the banana cake stack well? I want to ice it with the cream cheese frosting and then cover with fondant. I’ve never stacked it, Andrea. I’ve had others ask the same though. I imagine it would with a layer of frosting in between. Let me know how it turns out if you try it! Any idea how long they would need to bake as muffins??? Thanks in advance!!! I don’t know, Erin. I’ve never tried them as muffins. If you give them a try, please let me know. I get that question a lot! Has anyone tried this with a substitution for the eggs? We have a food allergy kiddo. What do you normally use as a substitute in your baking, Bernadette? If you have an alternative that works well with other cakes I would imagine it would work with this recipe too. This is the fourth time since July I have made this cake! My family and friends RAVE about it! I fold in about 3 ounces of fresh blueberries to batter before I bake it …. after frosting cake i put few of them on top to garnish. GREAT CAKE AND FUN! Oops..it rating button tooo soon…5 STAR CAKE! Awesome! Glad you love it too, Karen! Wow! 4 times since July! That’s great! The blueberries sound like a wonderful addition, Karen! I’ll have to try that! Can anyone tell me if ur supposed to use 1.5 cups of ripe bananas and 3 fresh bananas or one or the other. Or both. The way its listed is a but un clear. You need about 1.5 cups mashed bananas (very ripe). If you’re using fresh bananas, use 3. If your bananas are frozen, use 4. The consistency of the banana changes significantly when frozen, and I always find you need a little more than when using fresh. I’ve been making this cake for close to 15 years. 325 F is actually a better temp for the one hour bake time. I always use a 9×13 glass pan without any problem, Ellen, but thanks for your tip. This may help others! I made some modifications in order to cut down on sugar and add nutritional value: I substituted one cup of maple syrup for one of the cups of sugar, and a cup of desiccated coconut for the other, and also two cups of whole wheat flour for two of the three cups of white flour. I also substituted one cup of the same coconut for one of the cups of icing sugar for the frosting and cut back by one half cup. I loved the hint of coconut as well as the grainy texture whole wheat flour adds (its natural sweetness as well.) Yummy! Holy Moly, Susan! You’ve invented a whole new cake. I may just have to write a blog post about it. Banana and coconut. Mmmmm! This recipe sounds great! I’ve decided to bake it in a bundt pan instead of the 9X13 pan. Can you suggest a temperature for baking? Hmm..That’s a tough one, Ronda. The bundt pan would be a lot deeper than a 9×13. I really don’t know how long it would take before it was cooked all the way through. I’m sorry! I’m making this right now for my son, on his way home from college today for Xmas…. and his birthday was a few days ago…..and he loves to eat! It’s -21 degrees in Ontario today. I’m just going to put it outside in the BBQ to cool (handy spot to keep the critters off it). Merry Christmas! I’m in Ontario too, Christine! My son comes home from college in Toronto tomorrow! I’ve put our cakes out in the snow too cool too. Gotta love Canadian winters! I make this all the time. It’s rare that I find a foolproof recipe. I like it best with frozen bananas could have been present in the peel. I reduce the Sugar by 25% sometimes and it still works perfectly. Yay! So glad you love it too, Candylee! Love your add-ins! I actually used the quick cooling method for my Crazy-Good Carrot Cake the other day, and it turned out even better than it usually does. Have you seen that recipe on my blog? It’s another AMAZING cake! Wonderful, wonderful cake. I do a lot of baking and this cake is a winner. I weigh all dry ingredients and find recipes turn out much better. I did do something for health reason I used canola oil instead of butter. I have made many banana loafs and it was suggested to use the oil. Also baking the cake at a low temperature is another reason it turns out so well. My banana. breads are baked at 300 degrees. Took longer baking but turned out great. Will make it again. Hi, do you use bottom heat only or top and bottom heat ? It sounds like our ovens are quite different, Diane. The only option I would have for top heat is my broiler, and I don’t use that. I put my cake on the middle rack of the oven, and set the oven to “bake” at the required temperature. Thank you! Have made this cake many times and it has always been a big hit! I too have to cook it 10-20 minutes longer, so definitely check with a knife in the centre before taking it out of the oven. I find that the toasted walnuts really add a wonderful taste and texture. This cake tastes even better the next day, so keep that in mind if you’re making it for a special occasion. I came back to the site to see if anyone had tried making cupcakes. Glad to see it worked out, as it is a LOT of cake for just the two of us. I have frozen pieces of it (with icing on), but figured cupcakes would be simpler. Glad you love it, Rae! I need to make the cupcakes too! I LOVE this recipe. I make it often. It’s a consistent, fail proof recipe. Thanks again. I’m glad you love it too, Calley! We made the recipe into cupcakes the other day! They’re amazing! This is my go to banana cake recipe. 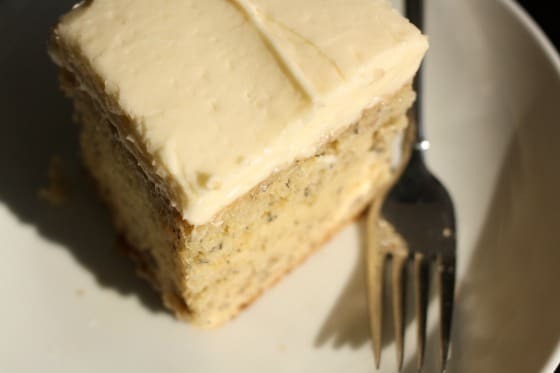 I am not sure which is more amazing the cake or the frosting…I have a house full of boys and am always cooking and baking for friends and family and this cake here is always a favorite. I have made many different banana cake recipes and this blows them away. I’m so glad your family loves it as much as we do, Annette! Most amazing cake EVER!!! Made it exactly by the directions (except for cooking 20 minutes longer) and it turned out perfect. Took it to a Women’s Meeting at church and everyone raved about it. Now this weekend going to make it as cupcakes/muffins for a Sunday brunch for mixed couples. Hoping it will turn out as well. Thanks!! We made the recipe as cupcakes last week, Toni, and they were great! We baked them for 46 minutes, and popped them in the freezer for about 15 until they were cool to the touch. I followed the recipe exactly as written. I used the recipe instructions to add lemon juice to the milk as I didn’t have Buttermilk. I tried to put the mix into my regular largeish loaf pan but it was too much so I transferred it to a 28 X 16 loaf pan and it baked perfectly by adding just 5 minutes to the suggested time. It was a delicious light and tasty banana loaf. It was so soft it was a little difficult to spread the butter. I didn’t bothere with the icing. The only change I’d make is perhaps to use a 4th banana instead of 3 that I used, to give it a stronger banana flavour. Definitely a keeper. Be warned this makes a huge loaf. This is the first time I’ve ever used my extra large loaf pan. Oh my goodness, Karen, I can’t believe you found a loaf pan that would hold this recipe! It’s a dessert cake made in a 9×13 pan. It’s huge! lol And yes, because it’s a dessert cake, it’s not dense like a banana loaf or banana bread would be. That’s why you would’ve found it too soft to spread butter on it. I’m glad you enjoyed it though! And glad it turned out in the pan that you used! This cake is so yummy! I have made it several times both in a 9×13 pan and a 15×10 jellyroll pan. I used the jelly roll pan because I wanted a thinner “sheet” cake to feed a crowd and it worked great! You have the buttermilk listed under the frosting. I put it in the batter. I thought I screwed up. Wow, Thanks for pointing this out, Denise. It’s a glitch that just happened the other day when I updated the recipe card. I’m so glad you let me know, and so glad you put the buttermilk in the cake batter! Add me to the list of people who are fans of this cake. I bookmarked this link a while back, but made the cake for a party this past weekend and it was a huge hit. Now I am going to try to figure out if I can make it using gluten-free flour so I can try it. Thanks. Yahoo! Another fan! So glad you loved it, Barbara! Let me know if your gluten-free version turns out well! If I’m going to bake cupcakes and mini cupcakes, how would you recommend adjusting the baking time? Last time I made this, i made as a full cake and it was soooooo moist and delicious!!! I’m afraid if I do cupcakes and mini cupcakes it will dry out. Thanks for your help! We made cupcakes a few weeks ago, and they were done in 45 minutes. We put them in the freezer for about 15 minutes. They weren’t quite as moist as the cake, but I think that’s just the nature of a cupcake. They were still amazing though! I’m not sure how long you’d bake a mini-cupcake for. I don’t think they’d take very long though. Maybe start testing them in 10 minute intervals after the recommended baking time you’d usually use for a mini-cupcake. Has anyone tried to bake this in a few round cake pans? I really want a round cake for my son’s birthday! Interesting. I’ve never heard anyone say they’ve adjusted the amount of milk. I often use 4 overripe (or frozen and thawed) bananas, and I use the full amount of milk. Glad it worked out for you though! in one part of your recipe you state baking powder and then baking soda which one is it please? I’m not sure where you’re seeing baking powder mentioned, Barb. It’s baking soda that’s required for this recipe. I saw that error in the Tip Hero Recipes. It listed 11/2 tsp. baking powder as an ingredient. Then on the instructions for making the cake it said 11/2 tsp. baking soda. So, being a baker I immediately knew it should be the baking soda. They really should revise that recipe for those that don’t know. Will be making this weekend. Thanks, Linda. I’m not familiar with Tip Hero Recipes. I’m guessing they’ve shared my recipe? My suggestion would be to notify them and let them know about the error. I made this cake and everyone liked it very much. Glad it was a hit at your house, Diane! lad you loved it, Sharon. I don’t think it’s possible to upload a photo into a blog comment, but you’re more than welcome to share a photo over on my Happy Hooligans Facebook page! Perfect name for this recipe! It is crazy good! This is my go to recipe for potlucks. I never bring any home…which is a good thing. Thank you for sharing this recipe. Woohoo! Your comment just made my day, Sharon. I’m so glad this cake is a hit with your friends and family too! I made it & froze it wrapped very well 5 months ago. Served it this weekend. So moist & delicious as if I had just baked & iced it. Family devoured the cake. I will be making this cake again! Oh! That’s great to know, Felicia! Thank you! I’m glad everyone loved it! I am trying this recipe right now. Love banana bread so hoping this will be a hit. Pics look incredibly moist and delicious. Just a little concerned about the oven/ freezer exchange. Would love to have moist cake like yours. I was wondering how old your Pyrex dish is? The older Pyrex dishes were made with borosilicate which was a far better product especially when changing temperatures rapidly. The newer Pyrex dishes are made cheaper with sodalime and tests show how inferior the product is. You can tell by looking under dish and if Pyrex logo (with r in circle beside) is written in lower case letters “Pyrex”it’s a newer not so good dish. If written in capitals “PYREX” then it’s made with borosilicate and far better product able to withstand temp changes far more. Also if put dish on top of white towel or cloth you can see greenish tinges along outer border in glass, that is sodalime and not as good…………. hope this helps. Quality isn’t like it used to be. But unfortunately mine is a newer dish and a bit scared to put in freezer. It’s not too high of a temp so that’s good.. so just wondering what your dish is made of? I will try and let u know. Also says if going to transfer dish put on towel and then freezer. Just don’t want the dish to have hot and cold areas at same time, that causes dish to shatter. Haha sorry been researching for a bit now just wanted to share what I learned. Oh it’s ready, an hour and ten.. I’ll wait couple min and put in freezer, fingers crossed! Recipe was exact, dish remained intact… Did I mention “BEST CAKE EVER! Moistest , wonderfully flavoured cake I’ve ever had. Kids are begging for it.. Finding them secretly beating on the bananas so they will get brown haha. But no joking is best I’ve ever had, and easy to prepare. Your instructions are exact.. This recipe is all over the web now.. wish I could adapt this recipe for other ingredients…like lemons. If you have anymore recipes laying around please share.. Thanks u.. I made this cake yesterday & thought it was actually a misprint when I saw the temperature. But I followed the directions completely & I was totally blown away! This is THE best cake I ever tasted! My husband says it’s the BEST cake in the world! It just melts in your mouth. Very moist..just perfect!! This will always be my go to recipe when my bananas get ripe…Or when I am having company. Thank you so much for this amazingly Crazy cake recipe!! I have made this multiple times and it is absolutely delicious!! Does the temperature or time baked changed when doing two round pans? Best darn cake ever! Followed directions accordingly. Only had to bake about 20 minutes longer than called for. We loved the cake and icing. No problem with 9 by 13 Pyrex pan. In freezer from oven. Thank you for posting. Will be making this again. This cake is absolutely delicious, have made it twice now. First time I followed the recipe exactly, and it was awesome, then second time I only had 3 frozen bananas so I threw in some very finely shredded apple (almost an applesauce consistency), and it too was just as fantastic. I did reduce the icing sugar to 3 cups for the icing… which was still really sweet. Next time we will throw in some walnuts!! This is a delicious cake but I made some adjustments. I put in 1.5 cups of sugar (instead of 2 cups) and I put in slightly over 0.5 cup olive oil (instead of butter). Other than that I didn’t tinker with the ingredients. I’ve made this twice and never put it in the freezer. I just left it to cool on the counter and it’s still incredibly moist. I think switching from butter to oil may make it moister so the freezer isn’t necessary. The second time I made it, the batter looked like it was going to overflow. Luckily, it didn’t. It just rose to the very top edge. I also had to bake it for an extra 20 minutes. As for the icing, I use a different, but similar, cream cheese recipe. It has cinnamon in it and my kids love it so I don’t change that. I don’t put the icing on the cake. I put it in a bowl so whoever actually wants it can slather it on. Everyone who has tried this cake, loves this recipe. Thank you! This is such a great cake,we love it,but you definitely need a bigger pan than a 9×13,it makes a huge cake,and I don’t refrigerate the cake when it’s iced,it tastes better if you leave it on the counter.Thanks for the great recipe,one of my favs. I’ve only ever made it in my 9×13 inch pyrex dish, Christy. What size are you using? This cake was fantastic! My father-in-law who doesn’t really like cake absolutely loved it. Huge hit in our house. Great flavor and texture, definitely a keeper! Yay! It’s a huge compliment when someone who doesn’t even like cake loves it! I’m so glad it was such a hit with your family, Kelly! So delicious! I’m over-flowing in frozen ripe bananas and now have a great use. I think the amount of frosting is perfect for the height (how much it rises) and density of the cake. I did refrigerate it after the first day and prefer it very cold. Maybe that led to the density? I don’t recall the density of the first couple of pieces. How would mashing bananas and creaming them with the cream cheese and butter for the frosting? After all it is a banana cake and it would go good don’t you think? I’m not sure how that would turn out, Robert. Bananas would definitely change the consistency of the frosting, and bananas tend to go brown when exposed to air for very long, so it could change the colour of the frosting as well. I would do some googling. Look up Banana Cream Cheese Frosting (or icing), and see if any recipes come up. Be sure to check reader comments/reviews of the recipe to get an idea of whether or not it works well. Good luck! Are you sure the oven is only 275°? Cake was fantastic! The only thing I did different is not put it in the freezer. I was concerned about it heating the whole freezer up?? It was about 30 outside here, so I set it outside to cool, and then brought back inside to frost. So yummy, so moist, not dry like regular banana bread can be! I real keeper that’s for sure! Can I make a strawberry version of this by simply substituting mashed fresh strawberries for the banana? The consistency of the two might be too different for you to get the same results, Bradley. I really can’t say as I’ve only ever used bananas to make this cake. Made the cake today….very soft and moist. I reduced the sugar by half. Thank you for the recipe!!! I’ve never used parchment when baking cakes, Kathy. I just use it when I’m making cookies and no-bake bars etc., so I can’t say for sure. If you normally use it for cake-baking, and don’t have any problems with it, I would imagine it would work with this recipe. I followed directions exactly and mine, while good, turned out … rubbery? If that makes sense. It was very rubbery breakfast bar like? Any guess why it wasn’t more fluffy cakey? Great recipe and great post! Definitely going to try it out. Thank you for sharing and keep up the good work.